In April 1906, after completing the School of Application at Annapolis, Maryland, Smith sailed for the Philippines, where he served on expeditionary duty with the 1st Marine Brigade until September, 1908. He returned to the United States the following month and was stationed at the Marine Barracks, Annapolis, until December 1909, when he embarked for expeditionary duty in Panama. Returning from Panama in April 1910, he served at Annapolis, Puget Sound, Washington, San Diego, California, and the Recruiting Station, Seattle, Washington, before sailing in September 1912, to rejoin the 1st Marine Brigade in the Philippines. He remained with the 1st Brigade until April 1914, when he took command of the Marine Detachment aboard USS Galveston. He served in that capacity in Asiatic waters until July 1915. He returned to the United States the following month for duty at the Navy Yard, New Orleans, Louisiana. From there, he was ordered to the Dominican Republic in June 1916, as a member of the 4th Marine Regiment. During that unit's operations against native insurgents, he saw action in the march to Santiago and engagements at La Pena and Kilometer 29. Returning to the United States on May 30, 1917, he sailed for France and World War I just two weeks later as commander of the 8th Machine Gun Company, 5th Marines. Smith's 8th Machine Gun company was assigned to the French Chasseurs Alpins to learn from the experienced French troops on the tactics of the War. After this time the 8th was assigned to a camp to off load arriving American vessels where Smith became second in command of the camp. Smith was detached from the 5th Marines and sent to the Army General Staff College at Langres, from which he graduated in February 1918. He was the first of only six Marines ever to complete this course. He was then named Adjutant of the 4th Marine Brigade, which was a part of the US Army's 2nd Infantry Division, serving in a relatively quiet sector southeast of Verdun. During the fighting in and around Belleau Wood, he played "a vital though undramatic" role as Brigade liaison officer, overseeing internal communications within the Brigade. Transferred to the I Corps, First Army, in July 1918, he served as assistant operations officer in charge of liaison during the Aisne-Marne, Oisne-Aisne Offensive, St. Mihiel and Meuse-Argonne offensives. On 25 November 1918 Smith was promoted to the temporary rank of major. After the Armistice he participated in the March to the Rhine through Belgium and Luxembourg as an assistant operations officer with the Third Army, and served with the General Staff, U.S. Army, during the occupation of Germany. For his service at Belleau Wood, Smith was awarded the Croix de Guerre with palm by the French government. He also received a Meritorious Service Citation from General John J. Pershing, Commander in Chief of the American Expeditionary Forces, for which he was later awarded (in 1932) the Purple Heart, one of the first awarded for merit. Returning to the United States in April 1919, Smith's assignments in the next four years included duty at Norfolk, Virginia, study at the Naval War College, Newport, Rhode Island, and service in Washington, D.C., with the War Plans Section of the Office of Naval Operations. There, he was the first Marine officer to serve on the Joint Army-Navy Planning Committee. Leaving Washington in May 1923, he served aboard the battleships Wyoming and Arkansas as Fleet Marine Officer, U.S. Scouting Fleet, until September of that year. In February 1924, after serving at Marine Corps Headquarters and in the West Indies in connection with joint Army-Navy maneuvers, Smith joined the Marine Brigade on expeditionary duty in Haiti, serving as that unit's Chief of Staff and Officer in Charge of Operations and Training. He returned from that country in August 1925, to serve as chief of staff of the 1st Marine Brigade at Quantico, Virginia, until September 1926, as a student in the Marine Corps School, Quantico, from then until June 1927, and as Post Quartermaster of the Marine Barracks, Philadelphia Navy Yard, from July 1927 to March 1931. In April 1931, Smith began another tour of sea duty, this time aboard the USS California as Aide to the Commander and Force Marine Officer of the Battle Force, U.S. Fleet. He served in those capacities until June 1933, commanded the Marine Barracks at the Washington Navy Yard from then until January 1935, and served the following two years at San Francisco, California, as chief of staff, Department of the Pacific. From there he was ordered to Marine Corps Headquarters in March 1937, to serve two years as director of the Division of Operations and Training, after which he was Assistant Commandant of the Marine Corps under Major General Thomas Holcomb from April to September 1939. After the latter assignment, General Smith assumed command of the 1st Marine Brigade at Quantico, taking that unit to Guantanamo Bay, Cuba, for extended amphibious training in October 1940. In February 1941, when the brigade was redesignated the U.S. 1st Marine Division, he became that organization's first commander. He returned with the division to Quantico in April 1941, and in June of that year he was detached from it to take command of the organization that eventually became the Amphibious Force, Atlantic Fleet. Under this command, the 1st Marine Division and the 1st and 9th Army Divisions received their initial training in amphibious warfare. Moving to San Diego in August 1942, the general took command of the Amphibious Corps, Pacific Fleet, under which he completed the amphibious indoctrination of the 2d and 3d Marine Divisions before they went overseas, and the 7th Army Division and other units involved in the Aleutians operation. The Amphibious Corps, Pacific Fleet, was later redesignated the V Amphibious Corps, and in September 1943, as commander of that unit, General Smith arrived at Pearl Harbor to begin planning for the Gilbert Islands campaign. He continued to head the V Amphibious Corps until August 1944, when he was named Commanding General, Fleet Marine Force, Pacific, at Pearl Harbor. Subsequently, he commanded the Fleet Marine Force. In addition to that post, he commanded Task Force 56 in the Battle of Iwo Jima before returning to the United States in July 1945, to head the Marine Training and Replacement Command at Camp Pendleton, California. Holland was known for the quote "In our corps without responsibility and discipline we would not have won the Battle of Iwo Jima." U.S. Navy Admirals Raymond Spruance and Richmond Turner wanted General Smith to command the Okinawa invasion forces. They were overruled by CinCPac, Admiral Nimitz because General Smith had sacked a U.S. Army General, Ralph Smith, during the Saipan campaign, and justifiable animosity between senior U.S. Army staff existed towards General Smith due to his service chauvinism. U.S. Army General Simon Bolivar Buckner, Jr. was appointed to command the Okinawa invasion in his place. Coincidentally, General Roy Geiger USMC, was placed in command of Tenth Army in June, 1945 when General Buckner was killed in action. A lieutenant general when he was retired May 15, 1946, at the age of 64, he was promoted to general on the retired list for having been especially commended in combat. Smith took up residence in La Jolla, California, where he pursued his hobby, gardening. Following a long illness, General Smith died January 12, 1967 at the U.S. Naval Hospital in San Diego, California, aged 84. Funeral services were held on January 14, at the Marine Corps Recruit Depot Chapel, the general was interred with full military honors in Fort Rosecrans National Cemetery overlooking San Diego harbor and North Island. At the time of his death, General Smith was survived by a son, Rear Admiral John V. Smith. General Smith's wife, the former Ada B. Wilkinson, had died in 1962. Camp H. M. Smith, located on Oahu, Hawaii, is a Marine Corps base named after General Smith. It is home to the Pacific Command, Marine Forces Pacific and other commands. In the film Flags of Our Fathers, General Smith is portrayed by actor Gordon Clapp. 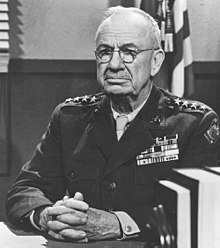 ^ Smith, General Holland M., USMC (Retired) (1949). "Chapter 2: The Early life". Coral and Brass. Washington, D.C.: United States Marine Corps. p. 24. OCLC 5170569. ^ Hastings, Max (2008). Retribution: The Battle for Japan, 1944–45. Knopf Publishing Group. p. 376. ISBN 978-0-307-26351-3. "General Holland McTyeire Smith, USMC". Who's Who in Marine Corps History. History Division, United States Marine Corps. Retrieved 2007-09-30. Gailey, Harry A. (1987). Howlin' Mad Vs. the Army: Conflict in Command Saipan 1944. New York: Dell Publishing Co.
Smith, General Holland M., USMC (Ret.) (1949). "Chapter 2: The Early Year". Coral and Brass. Washington, D.C.: United States Marine Corps. p. 24. OCLC 5170569. Holland Smith's autobiography, online. Venzon, Anne Cipriano. From Whaleboats to Amphibious Warfare: Lt. Gen. "Howling Mad" Smith and the U.S. Marine Corps (Praeger, 2003). 164 pp. Wikimedia Commons has media related to Holland Smith.